Thank you to all the 37 people who came along to the Lent Lunch, hosted by Simon and Jacqui, at which well over £250 was raised for the ongoing work in Kagera. A big thank you to all those who supported the Valuation Day in various ways on 13th April, including those who brought along items to be valued, who baked delicious cakes, served refreshments and set up/cleared away. The event raised £145-00 for the never ending list of jobs to maintain and improve our church building! Thank you also to Oliver miller (Bishop & Miller Auctioneers) and his wife – we couldn’t have done it without you!! Easter is an exceptionally busy time in the church calendar. Check the Events list for details of various services in Great Finborough. Soon after, on 24th April, is the Annual Parochial Church Meeting, starting at 7.30pm,to which all who are interested in what’s going on or what is planned for St Andrew’s are most welcome. Spring time ! A time to clean, tidy, sort out your cupboards! No doubt you’ll come across items you’ve forgotten you had, wonder why they were kept…..and how much are they worth?? Why not bring them along to our fundraising valuation event from 9.30 am – 12 noon on 13th April? See Events for more details. We currently have vacancies for a Churchwarden, Church Secretary, and a Minutes Secretary. The latter would be required to attend 5 or 6 evening meetings per year, then type and distribute the minutes to members of the Parochial Church Council (PCC). Please contact Rev Childs as soon as possible if you would like to become more involved in the church or help in any way. The Annual Parochial Church Meeting will be held at 7.00 pm on 24th April. anyone who is interested is welcome to attend and find out more about what’s going on in our church, but only those who are on the Electoral Roll may vote/ have their say. In 2019, the six-yearly revision of the Electoral Roll is due; this means that everyone has to come off the roll and re-apply; forms are now available in the church, or contact one of our officers if you need one to be sent to you. New members are very welcome; please ensure that your application form is completed and submitted as soon as possible. A new Electoral Roll of church membership must be prepared every six years, before the Annual Parish church Meeting which will be held in the church on Wednesday 24th April. Those currently on the roll for St Andrew, Great Finborough and those who wish to apply for the first time are required complete an application form, available in church or from the Electoral Roll Officer, Hilde Cobbald. HAPPY NEW YEAR to one and all! The church decorations remained into the new year – and the crib, at least, will still be on display for the very special Epiphany Songs of Praise – a truly Royal occasion – at 4.00pm on 13th January, followed by a ‘Royal Tea’! This month’s coffee morning at the Chestnut Horse was an opportunity for friendly chatter, tea/coffees (free refills!) and delicious cake, while raising funds for the Stowmarket Food bank. This regular event, held on the second Tuesday of each month, usually at the Chestnut Horse, is now well established. Please note the new times, 10.00am – noon, and the first price increase (to £2.00) since it began. Check the Events calendar for any updates/ change of venue/etc. As always, December is a very busy month in the church. We shall be pleased to see as many people as possible at our services – in particular the Christingle, Village Carols and, on Christmas Eve, the Crib Service and – at 11.30pm – Holy Communion. See the Events page for more details and be assured of a warm, relaxed welcome and, in most cases, refreshments afterwards. THANK YOU to all those who have supported our monthly coffee mornings, held in the Chestnut horse – and occasionally in the church. this month, members of the local ‘craft group’ were our hosts, raising £160.50 for church funds! the next coffee morning will be on Tuesday 8th January, 9.30am. Check the website for confirmation of where it will be held…. Thank you to all who journeyed ‘All Around the World’ at the Autumn Supper last month. Feedback suggests that it was as good as – or even better than previous years, and we enjoyed planning, and preparing for it (although, admittedly it was hard work at times. We couldn’t do it without those who give of their time and talents voluntarily, and we don’t take it for granted. If you enjoy getting involved please don’t be shy…helpers are always welcome!! If you haven’t yet bought your tickets for the Ipswich Gilbert & Sullivan Society concert on 1st December you can still buy them on the night at the door. There will be a selection of music from classical to pop, folk to musicals and, of course some Gilbert & Sullivan favourites. This month kicked off with Messy Church on the first Friday as usual. It’s becoming increasingly popular and is open to all children – not just regular churchgoers. Children must be accompanied by an adult, but there’s no need to book, and no charge. PLEASE NOTE that the Service of Remembrance will commence at 10.50am on 11th November. At 7pm the church bells will be rung as part of the National event “ringing for peace” . We are grateful to those who made poppies for the stunning display in the church. Thank you especially to Mary Williams who did some research about those men from the Great Finborough area who fell in WW1; information can be found on temporary display boards in the church. A temporary display, commemorating the centenary of WW1, can now be viewed in the church, thanks to a band of local volunteers! 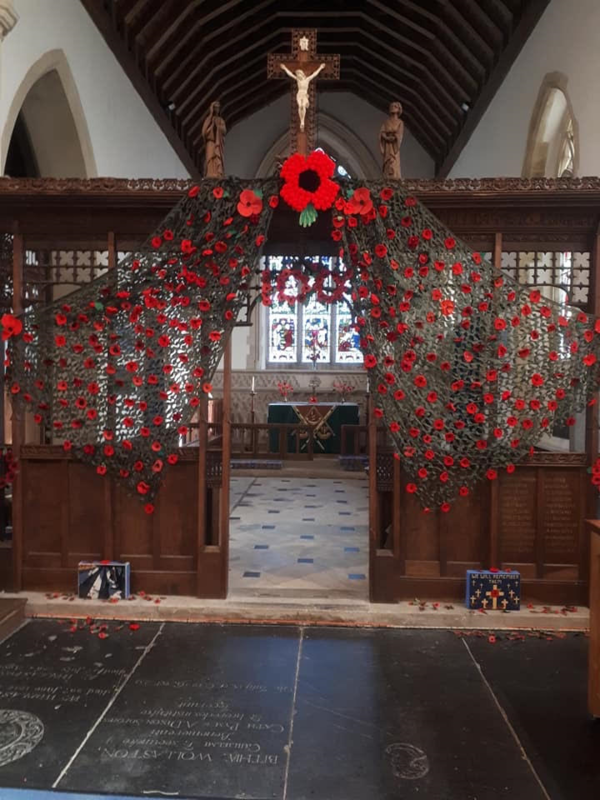 Poppies ‘cascade’ from the rood screen (which was originally installed in memory of the fallen), and display boards around the church give more detail. The church is open to everyone daily, except Friday afternoons during term time, when it is filled with children from the nearby school, so do come and look inside. The special service to Remember the Dear Departed will take place on 28th October. If you wish to add a name to the list of departed loved ones, please contact Rev Childs. Our Macmillan Coffee morning attracted a number of regular coffee (and cake!) lovers, raising £176 in the process. Thank you to all who gave so generously! There’s always lots going on…please do check back to our Events page regularly to keep up to date – we welcome everyone warmly. HOT NEWS!! 1. Following the final ‘collapse’ of our 1920’s organ we have been fortunate to have been loaned a Technics SX G100 organ by Pat Ling (of Onehouse) which – thanks to Tim, Peter, Ollie and Tommy – was transported to the church on Wednesday 5th September. HOT NEWS!! 2. More thanks…this time to John Griffin for generously giving of his time, expertise – and contacts! We now have a fully functioning hearing loop installed. If you will benefit from it, please come along to a service to try it out!! At the beginning of last month, a group of children – Amy, Lily, Mia, Eleanor and Jessica – visited the church to present Rev Chris with items they had collected for the Food Bank having heard that some families struggle for food in the summer holidays. We are all very proud of them, as no doubt their own families and school are! Now to another month…and another busy time ahead! First off we have Messy Church for children of all ages (arguably suited to under nines – but we’re all children at heart! ), accompanied by an adult, on Friday 7th September. There are toys for the very young – and they’ll probably enjoy the music and food too!! For the gentlemen of the village there’s Men’s Breakfast the following day – the hearty English breakfast is excellent preparation for those intending to ‘Ride or Stride’ in aid of Suffolk Historic Church Trust on the same day. If you decide to join in at the last minute sponsor forms will be available in the church, which will be open from 9.00am until 5.00pm. On Tuesday 11th we are holding a Macmillan Coffee Morning at the Chestnut Horse. Needless to say, everyone is welcome to pop in or stay for a while and support this worthy cause. Sunday 23rd September is the day of our Harvest Festival; do join us and if you wish to stay for the ‘bring and share’ lunch afterwards. Details of all these events can be found on the Events page; this month’s services are also on the church gate noticeboard, with full details of all services in the Benefice on the porch noticeboard…. It doesn’t slow down after all of the above!! SAVE THE DATES of our forthcoming Autumn Supper, ‘All Around the World’, on 27th October, Gift Day on 3rd October, and a wonderful musical evening on 1st December (see Events)…. In the peak school holiday period, we were pleased to see a healthy number at the monthly ‘Messy Church’ session. The next one will be on 7th September (see EVENTS) – no booking required! Coffee morning at the Chestnut Horse was also well attended. We’re pleased to announce that the new (fully functioning!) hearing loop is will be installed soon BUT the bad news is that our organ is in a poor state – and possibly beyond repair. Discussions are taking place about the way forward…..
On the brighter side, preparations for the Autumn Supper (27th October) are under way – SAVE THE DATE, and watch this space!! A busy start to the month with Messy Church on 6th July, and our monthly coffee morning at the Chestnut Horse on 10th. We expect there will be a higher demand for soft drinks, rather than coffee/tea, next month with schools closed and children to entertain. All ages are welcome! Do you enjoy cycling , or walking, or just having a chance to sit down for an hour or so? Whichever you prefer, there’s an opportunity to take part in this year’s Suffolk Historic Churches Trust Ride and Stride on Saturday 8th September – and raise funds for St Andrew’s church at the same time! Please see the Events page for more information…. It’s great to see real signs of summer at last….the only downside is how the churchyard weeds flourish and the grass grows faster than usual!! Thank you to those who tend their family graves, and to those who are able to do that extra bit more by mowing the surrounding areas. The churchyard is to many a space for remembering, and the colourful flowers may just help to bring back happy memories. The popularity of Messy Church is fast growing, but so far we haven’t had to put a cap on the numbers! Held on the first Friday of each month, the next will be on 6th July. Come on children…tell your friends and ask an adult to bring you along – it’s great fun! This month’s coffee morning on 12th June will be raising funds for Parkinson’s UK. Do come and join us at the Chestnut Horse for the usual selection of delicious cakes with tea or coffee. All are welcome, no matter how old or young. Dave, Jade and George are great hosts – it’s great to see our local pub flourishing again! Their chef, Lee, has a growing number of fans too! Great Finborough Open Gardens – organised by the village garden club – takes place on 1st July, from 12.30pm. Buy your ticket and pick up a map from the stall near the village car park then stroll around the gardens (at least fifteen will be open at the last count), stopping off for refreshments on the way. We are very fortunate that our church has been chosen to benefit from this annual event in 2018. See the Events page for times of services and more details of what’s coming up…..
A busy month ahead!! The long awaited fashion Show is here at last – 0n Thursday 5th April – if you haven’t bought your ticket you can pay at the door, enjoy a welcome drink and relax for a while (and perhaps treat yourself to a new fashion item!). See ‘Events’ for more information. The following day there will be Messy Church for the children, 3.30 – 5.30pm. All ages are welcome for food and fun! The monthly coffee morning at the Chestnut Horse comes around so quickly – and happens again on Tuesday, April 10th. On Sunday, 8th April, there will be a special short service at 3.00pm to commemorate the 100th anniversary of the death of Lieutenant Colonel Robert dewing RE DSO, grandson of Robert Pettiward of Finborough Hall, attended by a member of his family. there is a plaque and stained glass window in his memory on the north side of the chancel. Dave and Jade give us a very warm welcome and regulars enjoy a friendly chat over a cuppa and cake, while Helen displays a selection of Avon products available to order. Everyone is welcome, of any age. The Annual Parish Church Meeting will be help in the church on 11th April; if you are interested in the church – even if you don’t attend services – you will be very welcome, but only those on the church electoral roll may vote. For more information about forthcoming events and service, see EVENTS page. MORE THANKS again this month – for your support at the Lent Lunch, which raised £212 for Oxfam and at another successful coffee morning hosted at the Chestnut Horse, where we raised funds to be shared between the church and Stowmarket foodbank. The pub is experiencing a dramatic revival since new tenants Dave and Jade arrived, along with their excellent chef, Lee, and apprentice chef, George – they have already put their own stamp on the venue and a warm welcome (in all senses of the word!) is guaranteed. Now that there are occasional signs of spring, our thoughts turn to organising more entertaining fundraising events. The prospect of warmer weather is most welcome, and hopefully we’ll see more people in the church as result. However we’re very aware that the building is unbelievably cold at times so our new major fundraising project will be for a better heating system, while funding the general running of the church must always take precedence. Holy Saturday falls on 31st March – do join us, and bring the children, to Easter Praise at 5.00pm, followed by an Easter Egg Hunt and refreshments. On Easter Monday the Race of the Boggmen returns to the Chestnut horse (see Events for more details). Bring the family and join in the fun! Tickets for our Fashion Show to be held on 5th April are selling fast. See the Events page for more details. THANK YOU to all those who came along to this month’s coffee morning (with apologies for the confusion over its location!). After moving from the church to the pub – opened especially for us on the morning although the Chestnut Horse officially reopens on Friday, 16th February. We received a warm welcome and the sum of £87.50 was raised – to be shared between church funds and the British Heart Foundation. We look forward to hearing Simon’s view on the pub food as he won a ‘meal at the pub for two’, generously donated by the new tenants. WE ARE ALWAYS GRATEFUL TO VOLUNTEERS – our church wouldn’t be the same without them! As some grow older, they hope to pass on their duties to others, so this is an appeal to you! Would you consider… *serving teas/coffees after a service, *arranging flowers,* cleaning the church 2 or 3 times a year, * helping to organise Messy Church, *mowing/weeding a section of the churchyard, *undertaking routine repairs, *polishing brass, *or anything else you think would be helpful! Please contact Rev Chris or any member of the PCC if you’re willing…. 9th January 2018: It was good to see so many ‘regulars’ at this month’s coffee morning….our next coffee morning at the Chestnut Horse will be on Tuesday 13th February, 9.30-11.30am; think hearts, flowers – or pancakes?!! HAPPY NEW YEAR TO ONE AND ALL! You are welcome to join us at any of our services and/or fundraising events…or visit the church at any time – it is normally open to visitors during daylight hours all year round. THANK YOU to everyone who has supported St Andrew’s in any way during 2017! We are fortunate to be part of a wonderful community – and extremely grateful for all the help we have received during the past year, from cleaners, lawnmowers, key holders, flower arrangers, tea/coffee makers, cake bakers…and all the other voluntary roles people have willingly taken on, including ground works in connection with our ‘Loo project’. We couldn’t do it without you! PLEASE NOTE this Sunday’s Christingle service will begin at 5.00pm and not 11.00am as previously announced. Please join us for this all age service which is especially suitable for children (see Events for more information). SAVE THE DATE!!!! Thursday, 30th October – 6.30pm (in St Andrew’s church): ‘A Bit of a Do for the Loo’. Our opportunity to thank the many people who have given of their time, money and practical help along our journey to finally have 21st century facilities in St Andrews. 23rd October 2017: Thank you to all those who kindly visited St Andrew’s to make a donation on Saturday and/or by post to our Treasurer. We’re also grateful to those who ticked off items on our ‘wish list’ which has been put together now that the toilet/ kitchenette project is nearing completion. Those ‘little extras’ that will inevitably needed to equip the new facilities will make a very big difference!! We now looking forward to our next event – the ‘Retro Autumn Supper – which takes place this Saturday, 28th October. This is now almost a sell-out, but there may be one or two tickets or returns available. See EVENTS page to find out who to contact. 16th October 2017: DON’T FORGET…..Supporters’ Day this Saturday, 21st October, in the church between 9.30 and 12.30. We’re always grateful for the generous support given by so many, being it through financial donations and/or offers to join volunteers who help with churchyard maintenance, cleaning (or brass polishing if that’s your ‘speciality’! ), flower arranging, post-service refreshments, music, etc., etc.,…..
Everyone is welcome to call by and enjoy a cuppa while finding out what’s been going on behind the screen in St Andrew’s…..! TICKETS SELLING FAST for the ‘Retro’ Autumn supper on 28th October. Contact Tim or Simon – or buy your tickets on Saturday. Hope to see you there!! 26th September 2017: IMPORTANT NEWS UPDATES…. We are now four weeks into the toilet/ kitchenette project, with work going well so far…. Every effort is being made to minimise any dust/inconvenience caused – we are hopeful that the work will be completed by the end of October. *Local participants raised £220.00 sponsorship monies in aid of Suffolk Historic Churches Trust by cycling / recording visitors on 9th September. Half of this sum will directly benefit St Andrew’s while the remainder, plus any gift aid, will be distributed to Suffolk churches by SHCT in the form of grants. Thank you to everyone who gave time to meeting and greeting in the church and cycling during the day. *Our Macmillan Coffee morning at the Chestnut horse raised the fine sum of £170.00! Thank you to Scott for allowing us to take over the pub (and for the delicious cake he donated!) and to all those who generously supported the event. 28th October – Let’s Go Retro!! (tickets on sale NOW! )….see you there! 12th August 2017: Many people may be away on holiday, but there’s loads to look forward to in the weeks and months ahead! 9th September: Suffolk Historic Churches Trust Ride and Stride – raise funds for our local church by being sponsored to cycle, walk or jog around the area, visiting churches along the way – bring your dog or your children with you and discover parts of the area you haven’t seen before. On 12th September: Macmillan Coffee Morning at the Chestnut Horse, 9.30-11.30am. Coffee, tea (free refills!) and delicious cake, silly games, prize draw, good company and lots of fun – all in the interest of raising money for Macmillan Cancer Research. AND…Messy Church will be back – on Sundays 8th October, 12th November and 10th December (i.e. 2nd Sunday of each month) starting at 3.00pm. More details to follow….. Meanwhile, there may be a little more dust than usual in St Andrews as work gets under way to install the long-awaited toilet and kitchenette facilities. We are so grateful to all those who have supported us during our fundraising – but it’s not over yet since it was discovered that the organ blower must be replaced (at significant cost), so our efforts continue. Work should be complete by the end of October, so look out for news of celebrations!! 15th July 2017: Another successful Messy Church session was enjoyed by children and adults alike yesterday. Keep up to date with future dates and events by visiting our new Facebook page! 9th July 2017: DON’T FORGET – Messy church this coming Friday, 14th July, 3.30 -5.00pm. Crafts, games, worship, food and fun activities. Come along and join the fun! We bid a fond farewll to Rev Rachel Cornish as she leaves us to take up the post of full time Priest in Charge of the Alde Valley Benefice. Her Licensing will take place at Benhall Church on Thursday the 13th July. 10th June 2017: Signs of summers are well and truly here…so some along to Boarded Barn Farm on Saturday 25th June for delicious Strawberry Teas!! All are welcome! 1st June 2017: IMPORTANT NOTICE -This month’s coffee morning will again be held in St Andrew’s Church, 9.30am until 11.30am,due to the temporary closure of the Chestnut horse. Coffee/tea (free refills!) and delicious cake for only £1-50; all proceeds will be divided between St Nicholas Hospice and St Andrews Church. Please do join us for friendly banter, good fun and great refreshments! 3rd May 2017: FANTASTIC NEWS FOR CHILDREN!! is coming to St Andrew’s. Come and join in the fun – all children from the age of 0 upwards are welcome! First two sessions on Friday 16th June and Friday 14th July. See EVENTS for further details or contact Rev Chris Childs. 12th March 2017: Last night’s Quiz at the Pettiward Hall was enthusiastically supported….and raised over £500!! Thank you to all who supported – we look forward to seeing you again at future events. 11th March 2017: We have some WONDERFUL NEWS to announce! We have received an offer of funding up to £30,250.00 from Viridor Credits Environmental Company, towards our kitchenette and toilet project. This means that we shall be in a position to commence work within the next few months. We are, as always, tremendously grateful to all those who have supported our efforts thus far – practically, financially, by writing letters of support and attending our fundraising events. Meanwhile, we continue our fundraising efforts in the knowledge there will always be a need to make the facilities comfortable and easy to maintain…. 11th February 2017: SAVE THE DATE and start training! Suffolk Historic Churches Trust ‘Bike Ride & Stride 2017’ takes place on Saturday, 9th September. See Events, or register your interest here. 31st January 2017: SAVE THE DATE! Lent Lunch at Maple Lodge, 12.00pm. All welcome. 31st January 2017: GREAT FINBOROUGH QUIZ NIGHT TICKETS NOW ON SALE!! Saturday 11th March, Pettiward Hall, 7.30pm. See Events page for further details. 31st January 2017: An enthusiastic and hardworking team completed Phase 1 of the Kitchenette and toilet project over the weekend, when essential pipework was laid over a distance in excess of 100m in the churchyard. Thank you to all concerned for giving freely of their time and energy, and for keeping the workmen going with regular cups of tea/coffee. Special thanks to Graham (Cascade Pools) for organising hire, delivery and operation of the mechanical digger. 23rd January 2017: IMPORTANT NOTICE Parts of the churchyard will be closed to the public over the weekend of 28th/29th January while a group of volunteers are undertaking groundwork in connection with the ‘Toilet and Kitchenette project. Please see Events for further details. Meanwhile, we await the outcome of a grant application which, if successful, will pave the way for the internal work to forge ahead. We continue to seek further funding to ensure the project can be completed to a good standard and to restore church funds (having been seriously depleted after paying for essential roof repairs and upgrading of internal lighting to LED fittings after it became apparent that the existing lights were unsafe) to a healthy balance, to meet ongoing routine repairs and maintenance. We are extremely grateful to those who have donated so far, and further donations are most welcome. 22nd January 2017: Today a small tree, donated by Great Finborough Garden Club, was planted in the churchyard – near the pedestrian gate on the south side. This was donated by the club in honour of John and Brenda Grimaldi’s Diamond (60th!) wedding anniversary. They have lived in the village for many, many years – first at Westlegate and now at Gardenside – and are known to many. Brenda was a dedicated churchwarden for several years, while John has willingly undertaken ‘running repairs’, maintenance and much more …… A number of people were there to witness the tree planting in bright sunshine, and to wish the ‘Diamond couple’ health and happiness for the future. 11th December 2016: The absence of news updates over the past few weeks is purely due to the abundance of newsworthy events that have taken place! Whilst the renovation and repair of rainwater disposal goods (roof work, guttering, churchyard drainage pipes, etc.) is finally completed, the extent of the work far exceeded that which was originally anticipated – as did the cost, leaving our reserves severely depleted. We are more than ever grateful to generous villagers who have enabled us to see the project through, and on the positive side we have a watertight building which will hopefully remain so for several generations to come. This places us in a very good position to install the longed for internal facilities – fully accessible toilet and kitchenette – subject to a successful application for grant monies. We need to submit letters in support of our proposal from any one who recognises the importance of our church. If this includes you, please write a short letter ‘To whom it may concern’ indicating why you think we need a toilet/ running water in the church and email it to watts@snsr.freeserve.co.uk or send it to Rev Childs or Rev Cornish. Support for the recent Orient Express themed Autumn Supper was fantastic – and a complete sell-out! The annual Supporters’ Day was on the previous Saturday, and both events raised further much needed funds for St Andrew’s. ‘Thank you’ doesn’t really express how very grateful we are to all those who gave time, skills, physical effort and money. Now Christmas is fast approaching; details of services are on the events page and displayed on the church noticeboard. we hope to see you at any or all of them!